The cross is awarded to an officer or a Warrant Officer for an act or acts of valour, courage or devotion to duty whilst flying, but not while in active operations against an enemy. On 20 September 1950, word was received that a Mr. Charles Haven, one of the weather station staff at Eureka Sound, was suffering from severe blood poisoning and requiring immediate medical attention. Two alternatives were offered – either to fly in and drop a medical officer or attempt to land and bring the patient back for treatment. Either alternative represented an extremely hazardous undertaking. Eureka Sound lies some 700 nautical miles north of the Arctic Circle and within 500 nautical miles of the North Pole in a rugged uncharted area. Because of distance and unusual atmospheric conditions, normal radio aids to navigation were negligible. In addition, the proximity of the Magnetic North Pole renders the magnetic compass useless. Facilities for forced landings en route are non-existent; the nearest alternative suitable for landing in event of an emergency is Thule in Greenland. A flight into this region is further handicapped by a lack of meteorological information and the possibility of encountering unexpected bad weather either en route or at the destination. Squadron Leader Mitchell, Officer Commanding Northwest Air Command Communication Flight, fully understanding the risks involved, volunteered to carry out this perilous flight in a Dakota aircraft. He displayed masterful planning on such difficult problems as the correct gasoline load required on the run from Resolute Bay to Eureka Sound. He had to ensure the lightest possible landing weight for a very short runway at the destination and still have sufficient fuel for a flight to the alternative at Thule in case of inclement weather. The aircraft departed from Edmonton at 1315Z 20 September 1950 after a last-minute weather briefing, which subsequently proved to be the only complete one received during the entire trip. Refuelling stops were made at Baker Lake and Resolute Bay. On arrival at Eureka it was found that the landing surface consisted of a rough strip only 2,000 feet long marked out with oil barrels. Rather than drop a doctor and leave him stranded, Squadron Leader Mitchell decided to attempt a landing. This he accomplished very skilfully. Two hours later the aircraft was again airborne with Mr. Haven aboard. The return flight was made by way of Resolute Bay to Churchill through extremely trying weather conditions. On arrival at Churchill, this officer, although by this time exhaustingly fatigued, made a successful instrument landing against a 40 degree cross wind which was gusting to 36 knots. The dangerously sick man was delivered to hospital at 0530Z hours 22 September 1950. During the 40 hours and 15 minutes from the time of take-off until arrival at Churchill, Squadron Leader Mitchell had flown a distance of 3,139 nautical miles in 28 1/2 flying hours and had had only 3 1/2 hours sleep. When the aircraft returned to Edmonton at 2140Z 22 September 1950, a total of 3,857 nautical miles in far northern territory had been covered – the longest mercy flight in the history of the Royal Canadian Air Force. This officer’s determination, bravery, fortitude and devotion to duty in the arduous undertaking of “Operation Haven” has set an inspiring example and is worthy of the highest praise. 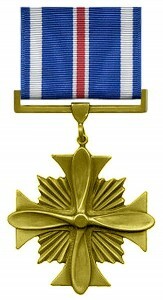 SCOTT, Flight Lieutenant Douglas Gerald (27799) – Distinguished Flying Cross (United States) – 55th Weather Reconnaissance Squadron (USAF) – Awarded as per Canada Gazette dated 7 May 1960. Recommended in June 1959; presented 3 May 1960 by Brigadier General Norman L. Peterson, Vice Commander, Air Weather Service, MATS, at McClellan Air Force Base, Sacremento, California. Cards carry notation, “See file C384-1C4 Vol.3.” Born in Ottawa, 9 April 1926. Home in Russell, Ontario; served in RCAF, 29 November 1943 to 25 April 1945; Canadian Army (Trooper), 26 April to 27 November 1945. Rejoined RCAF, 1 March 1948. On Korean Airlift with No.426 Squadron, 26 July 1950 to 3 February 1952.Detached from No.408 Squadron to Canadian Joint Staff, Washington and attached on 12 February 1959 to Air Weather Service, 55th Weather Reconnaissance Squadron (WB-50s). Detachment 3 was based at McChord AFB, Washington. At time of incident was reported to have flown 24 missions with USAF Air Weather Reconnaissance units and had 7,060 flying hours. Flight Lieutenant Douglas G. Scott, Royal Canadian Air Force, distinguished himself by meritorious achievement while participating in aerial flight on 29 June, 1959, 450 miles north of Point Barrow, Alaska, over the Arctic ice pack. While serving as aircraft commander of a WB-50, assigned to the 55th Weather Reconnaissance Squadron, 17 1/2 inches of a propeller blade on the Number Two engine separated and entered the fuselage, severing the control cables, power sources, hydraulic lines and the bomb bay door actuator, causing heavy drag and buffeting. Flight Lieutenant Scott analyzed the serious emergency and calmly made every needed compensation. He regained control and successfully returned his aircraft over 900 miles without additional damage, thereby saving a valuable aircraft and eleven crew members from possible injury or death. By his exemplary performance in the face of extreme danger, Flight Lieutenant Scott reflected great credit upon himself, the United States Air Force, and the Royal Canadian Air Force. W/C Jack Showler was the CO 408 Sqn, then based at RCAF Stn, Rockcliffe, ON, throughout the final few years of the nine-year (1949-1957) aerial photographic survey of continental Canada and the Canadian arctic islands (from sea, to sea, to sea). Together with the simultaneous SHORAN survey of the same areas, it was possible to create completely accurate specific maps of the whole of the Nation. The RCAF’s SHORAN operation was the first accurate mapping survey in the world, a capability that evolved solely by Canadian science generated by the RCAF and proven by the 408 Sqn aircrews over that nine year period. 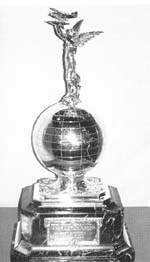 In 1957, W/C Showler was presented with the McKee Trans-Canada Trophy, in recognition of his leadership in the mapping of Canada. The Trophy recognizes persons who have made an outstanding, contemporary achievement in Canadian aerospace operations. He is also a Member of the Canadian Aviation Hall of Fame, wherein he was invested in 1959”. John Showler commenced flying instruction in 1936 in Saskatchewan, with the Regina Flying Club and enlisted in the RCAF in 1940. He instructed others at Summerside, PEI until 1942 when he was promoted to Flight Lieutenant and was posted to No. 164 Heavy Transport Squadron. In 1945, he was named commander of the air element of Operation Muskox in the Canadian Arctic, and served as commanding officer of the RCAF station at Fort St. John, B.C. In 1952, he planned and completed the first accurate mapping of the Canadian Arctic. The SHORAN program used in this mission allowed all equipment to be pre-positioned by sea or aircraft. More than 100,000 pounds of technical gear were flown in to Thule, Greenland and Resolute Bay.